LILAC experiences – higher or lower than you expected? I’m giving a webinar with Lisa Jeskins next week and we have been asked to reflect on LILAC 2016 and the lessons learnt. It’s been useful to read some of the blog posts and tweets again and try to recapture the hectic 3 days. LILAC for me is like all my Christmas’s come at once and I want it to last forever, but of course it doesn’t, it passes in the blink of the eye. So it’s what is left behind after the dust settles, the exhaustion is over and the buzzing in my head has stopped, that I want to focus on. We planned a panel session for the conference close, but concerns over travel meant this was cancelled. Not before I hadn’t written some ideas down about thoughts that struck me over the three days, so these were useful to return to a few weeks later. I started with this idea that information literacy is like the sea as I was just struck by how many words began with C that had been themes at the conference. There are some parallels with the sea and IL – like the ocean, information literacy has real depth at this year’s LILAC. That’s not to say we’ve been bobbing along at the surface level for the past 11 years, but I feel as a discipline information literacy is really growing in depth. The keynote from Char Booth really highlighted this to me. And yes IL is a discipline, which has rigorous research that underpins it, journals published in the field and at its beating heart, a vibrant community of practice. It’s this vibrancy and passion that stay with me, that the people who teach in this field really care about lifelong learning and they are trying to make a difference. Ultimately we all want people equipped with the ability to deal with what life throws at them, and to have choices about what to do, say and believe. This is what I think we call critical information literacy. It’s far more than critical thinking, or whether a source such as a newspaper or website is trustworthy. It’s about politics and social justice and it’s a big issue that is way more than any librarian can deal with on their own. So that leads me to an important topic, of collaboration. I’ve said it before but its worth repeating. All the best work I do is a result of a collaboration. If you work as a team, yes it’s harder in some ways and requires negotiation, but ultimately what you produce is way better. My recent work with Chris Morrison on copyright literacy shows that, but also the work I’ve done over the years with Emma Coonan, Maria Bell, Debbi Boden, Nancy Graham and Gwyneth Price. Collaboration is also vital because IL has been about librarians for a long time and this needs to change, we need to bring others into our community. It’s hard to know how to do that with the big L at the start of the conference name – are we being inclusive – possibly not. Do others attend and feel they are imposters, or interlopers? Possibly? We need to talk more to the people at the fringes who come to LILAC but perhaps feel that it’s not quite their space and who feel the need to apologise for not being a librarian. As I said earlier, if we are to tackle the really big important issues about why IL matters, then we need to work with others. It’s too big a job for one professional group alone and by working with teachers, administrators, educational developers, learning technologists and others, then we might get somewhere. This is why I was struck by James Clay’s keynote on Digital Capabilities – this terminology is one that appeals to a lot of groups of professionals, and James recognises the valuable role that librarians play, but we are just one of the players here. And what about the LILAC newbies, the new professionals and first time attendees? The IL community that exists is built on networks and friendships that in some cases have lasted over a decade. But we need new people and new young professionals to join us and feel welcome and part of this. LILAC is not a private members club, ruled by an elite who control all the power about what happens. It’s inclusive and open and welcoming, we hope, but how can we make it more so? Should there be a LILAC un-conference? Should we let the delegates have more say and control? What about the programme? Is it too packed? Is it too intense? Do we need more down time for people to just chill and reflect and chat? Or is the intensity part of it’s appeal and charm? I could have walked into any parallel session and I know I would have learnt something and enjoyed it, but at times I felt overwhelmed with what to attend with so much going on all at the same time. creativity – games, play fun, competition, panic rooms, virtual worlds. We had a hugely inspiring keynote by Nic Whitton and Alex Moseley on the role of games in learning where we learnt through play. And I was delighted to take part in the first Lilac Lagadothon, a games competition which was possibly the most exhausting 1.5 hour of my life pitching a new game 6 times! we heard a lot about criticality – critical pedagogy, critical librarianship and the relationship with social justice in talks from our keynote Char Booth and from Alan Carbery and Sean Leahy. 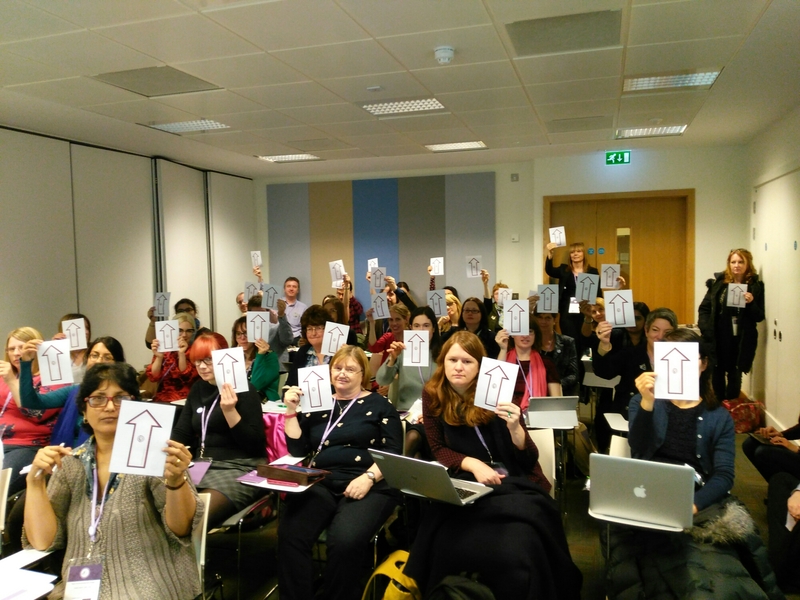 there was a strong theme of communities, collaboration and sharing and building on others ideas running through lilac – building networks of interest for example the Google group I set up for librarians interested in or pursuing doctoral research. capability (of ourselves) but also of others – not just digital capability, but librarians as teachers and researchers. and of course copyright – it doesn’t always come back to this for me, but I think framing copyright as information privilege (as Char Booth did) was really helpful to me and fits with the idea that copyright literacy and education is empowering! These are just a few thoughts, I hope to share more next week at the LILAC webinar, which will be advertised on the Information Literacy website, but should be next Monday (11th April) at 2pm. This entry was posted in Conferences & Presentations, copyright, information literacy, Jane's update, lilac16. Bookmark the permalink.